This interview with Canvas founder and director Ali Khadra looks at a series of talks curated by Canvas hosted at Art Basel by Hans Ulrich Obrist, Co- Director, Exhibitions and Programmes and Director of International Projects, Serpentine Gallery, London. Ali Khadra explains why and how Canvas intends to turn the talks into a book and documentary, and examines our preconceived notions regarding art, the middle east and sexuality with this series. 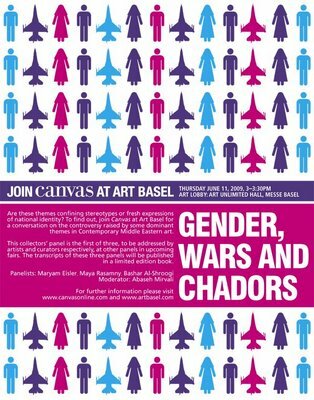 The interview is interspersed with extracts from the third of the talks: Gender, Wars and Chadors talk on Contemporary Middle Eastern Art, organised by Canvas magazine at Art Salon, 6 December 2009. Artists taking part in the third talk were Ghada Amer, Kader Attia and Akram Zaatari while Hans Ulrich Obrist chaired. Watch the video here. This entry was posted in highlights, Promos, Shows, Six Pillars to Persia, Uncategorized and tagged 104.4fm, akram zaatari, ali khadra, art basel, art salon, canvas, canvas magazine, chadores, gender, gender wars and chadors, ghada amer, hans ulrich obrist, kader attia, miami, resonance, Resonancefm, serpentine gallery, Six Pillars to Persia, wars on April 21, 2010 by sixpillarstopersia.